I had arrived in Dinar the previous evening. The bus did not bother to call at the town’s little otogar, or bus station, but dropped me by the roadside before it continued east towards the city of Konya. I watched the rear lights shrink through a stain of brown exhaust as it made for the high steppe. Beneath a wide sky stuck with stars and a black minaret I dragged my luggage into the town. The streets smelt of coal and I heard their footfalls before I saw them – the solitary men in brimless caps and the women in headscarves who stooped beneath half-lowered shutters, their worn faces flaring in the spills of buttery light, to make late purchases of bread, vegetables and cigarettes. The little hotel stood within a scruffy garden. It had been built after the 1995 earthquake, its concrete walls swagged in telephone wires, electricity and TV cables, which had been customised as washing lines where they festooned the balconies. The open-plan ground floor was sparsely furnished; a calendar and a portrait of Mustafa Kemal Atatürk, the man currently on the coins, a lifetime dead, decorated the walls. A reception desk, with a diary and hooks for room keys, overlooked the lounge area, where chairs and a sofa corralled a flickering television. At the other end of the room two metal-topped tables indicated the eating area where I found the hotelier the following morning. I was just back from a walk to the town’s Roman theatre, where the views over the westerly plain had allowed me my first glimpse of the Meander’s downstream seam. Turgay Darkeye, as the hotelier’s surname translated, was working his way through a bunch of parsley. ‘Diabetes,’ he muttered. ‘Only just diagnosed.’ Turgay’s pronounced features confirmed the Turkic, even Mongol, origins that his surname appeared to acknowledge. He had motioned for me to join him when the shawled Mrs Darkeye, a newspaper folded under her arm, arrived to take charge. Anxious to spare her husband the least dietary temptation, Mrs Darkeye redirected me to the unoccupied table, which she set about covering with pages from her newspaper. I noticed that the paper was recent; I had not been in Turkey for long and was keen for the latest news. To a tablecloth largely composed of small ads, I therefore got the obliging Mrs Darkeye to add the front pages. By the time she returned with my breakfast – a tight-waisted glass of black tea, bread, crumbly white cheese, ship-lapped slices of tomato and cucumber, honey and a boiled egg – and with more parsley for her husband, I was deep in the lead stories. Turkey had lately run into a political swell considerable even by its own turbulent standards. The country’s secular establishment, backed by the military, was confronting the ruling administration of moderate Islamists. Dates had been set, the newspaper reported, for the case that was to be heard against the governing party. Ak, as the party was called, had for some weeks been facing closure for what the chief prosecutor described as promoting an Islamic, and therefore unconstitutional, programme; the government had recently sought to overturn a time-honoured ban on the wearing of headscarves in universities, ministries and public offices. The secularists, prominent in the army and the state bureaucracy, did not like Islamic headgear. Invoking the example of Atatürk, the arch-secularist Father of the Nation, who had taken a tough line of his own against the superstitious fezes and turbans of the Ottomans, they meant to close down the government for supposing that its female citizens should be free to decide what they wore on their heads in the workplace. For almost five hundred years Turkey had been run as an Islamic theocracy. With the end of Ottoman rule in 1923, however, Atatürk’s secularists gained firm control; religion’s place in the public sphere was radically reduced, and many of the mosques and religious schools were closed. At the end of the twentieth century, however, the balance of power had begun to shift. Ak, having gained an impressive popular mandate in the previous year’s elections, now found itself in a position to demonstrate rather more muscle than was usual from the traditionally cowed Islamic lobby. In fact, Ak and its supporters had got their shot in first; months before the secularists had brought their closure case the Islamists had charged these opponents with unconstitutional activities of their own. The secularists, they claimed, counted among their number members of a clandestine organisation responsible for numerous kidnappings, executions, bombings, extortions, protection rackets, fixing of contracts and narcotics trafficking. This illicit organisation took its supposed name, Ergenekon, from the legendary valley in central Asia’s Altai Mountains where the Turkish national story had popularly begun; from this valley the Turks, guided by a talismanic wolf, were said to have emerged to make their destined migration westwards from the sixth century. Ak had it that Ergenekon’s dyed-in-the-wool secularists were behind a terrorist campaign whose sole design was to bring down the elected government. The objective, they claimed, was to spread such disorder that the army must intervene, as it had done in the past, and so wrest control of the country from the Islamists and return it to Atatürk’s secularists. The discovery the previous summer of incriminating documents and a half-empty crate of grenades in an Istanbul flat had spurred the authorities to pick up scores of disgruntled secularists – military men, journalists, academics, nationalists and assorted mavericks – in a series of dawn raids. Some Islamic sections of the media subsequently presented these supposed Ergenekon operatives as members of a vast organisation, which had been responsible for almost every instance of Turkish political violence over the past decade. These unlikely claims they substantiated by linking the grenades’ serial numbers with those of grenades apparently known to have been used in other incidents, as if Ergenekon’s entire terrorist campaign could be traced to the one crate of meticulously documented munitions. The secularists contended, in turn, that Ergenekon did not exist; Ak Party schemers, they claimed, had fabricated the organisation to exaggerate the extent of the secular establishment’s secret hand. These Islamists presented the rounded-up secularists as agents of the so-called ‘deep state’, as tools of the military-backed bureaucratic elite whose undying fealty was to Atatürk’s secular vision, whatever the expressed wishes of the electorate. The actual truth, according to the secularists, was that Ak and its supporters nursed a secret agenda of their own, and one quite as destabilising as the secularists’ was alleged to be; the Ergenekon investigations, designed to discredit and disarm the secularist opposition, were by way of preparation for an increasingly Islamicised, even Islamic, state. Turgay had finished his parsley. ‘So, what are you doing in Dinar?’ he asked. I was here, I replied, to spend some time on the Meander. In that word I heard the romantic character of a venture the locals would surely recognise; but what Turgay understood from my interest in the river was that I must be in irrigation. ‘No, no, not irrigation,’ I hastily replied. ‘Fish farming, then? Hydroelectricity?’ I did not much care for our parlour-game exchange. 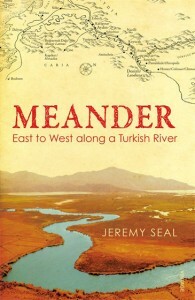 Turgay’s alarming assumptions, a local’s view of the Meander, conjured a different river from the one I had imagined. Anxious to head off his next best guess, in case it was that I must work in sewage treatment, which might fatally undermine my own enthusiasm for the project, I told Turgay what had brought me to Dinar. The hotelier appeared puzzled. ‘History?’ he echoed. ‘So you’d be interested in old coins?’ he asked, brightening visibly. It was then that three policemen entered the hotel. They were from the Zabıta, the paperwork police, and they wore pressed blue uniforms, with holsters. At their gesture the hotelier wiped the parsley from his mouth and followed them into the front garden. I watched through the open door as they gathered by a tree. They had slipped beyond my hearing. Deliberately, I supposed. I guessed I was witnessing one of those whispered visits that small businesses were commonly presumed to suffer east of the Balkans; an irregularity detected in the hotelier’s tax affairs that the Zabıta, as servants of the state, were duty-bound to refer unless a discreet cash consideration, one the officers were happy to disburse, could be found to resolve matters. ‘Trouble?’ I asked knowingly once the police had left. Jeremy Seal (jeremyseal.com) has had a lifelong fascination with Turkey. His first book, A Fez of the Heart, was shortlisted for the Thomas Cook Travel Book Award. He is also the author of The Snakebite Survivors’ Club, The Wreck at Sharpnose Point and Santa: A Life, which was a Radio 4 Book of the Week. 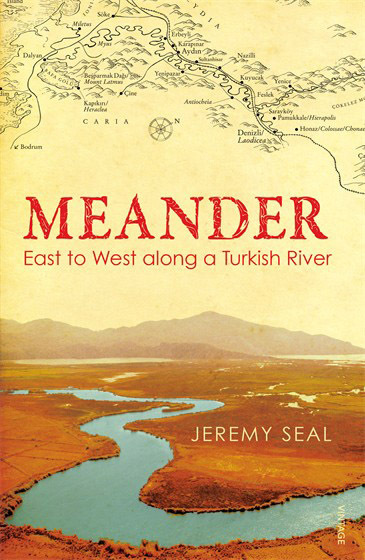 Meander was named Best Narrative Travel Book for 2012 by the British Guild of Travel Writers.